With leaf buds on the trees swelling and the bees enjoying the flowers on their branches - it really does feel like Wimbledon has stepped into Spring. 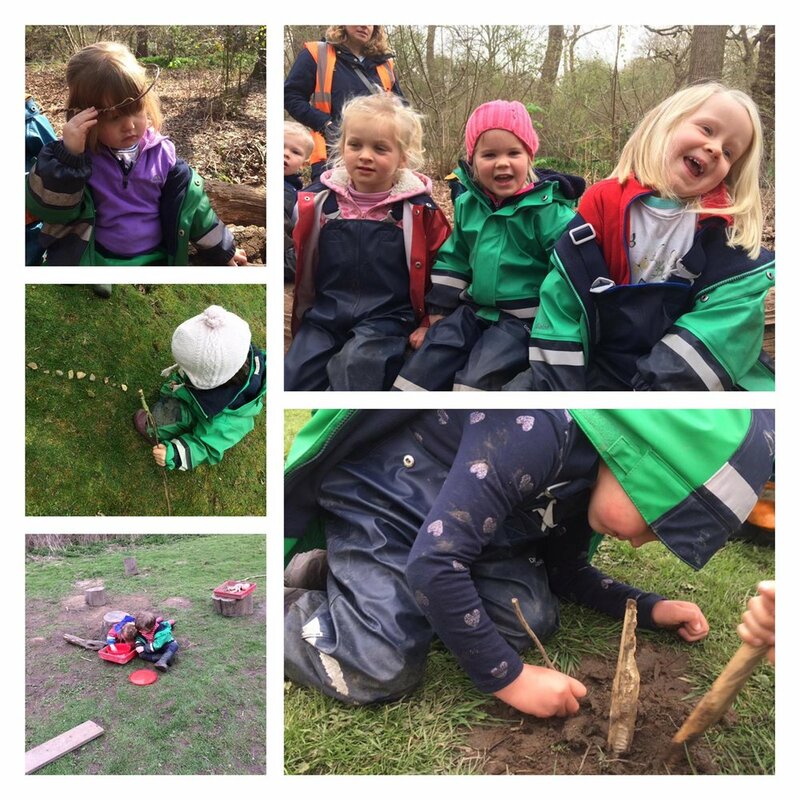 We have been really thankful to the parents who made it in for Stay and Play week this week as the children have really enjoyed having the parents join them on their morning adventure walks. 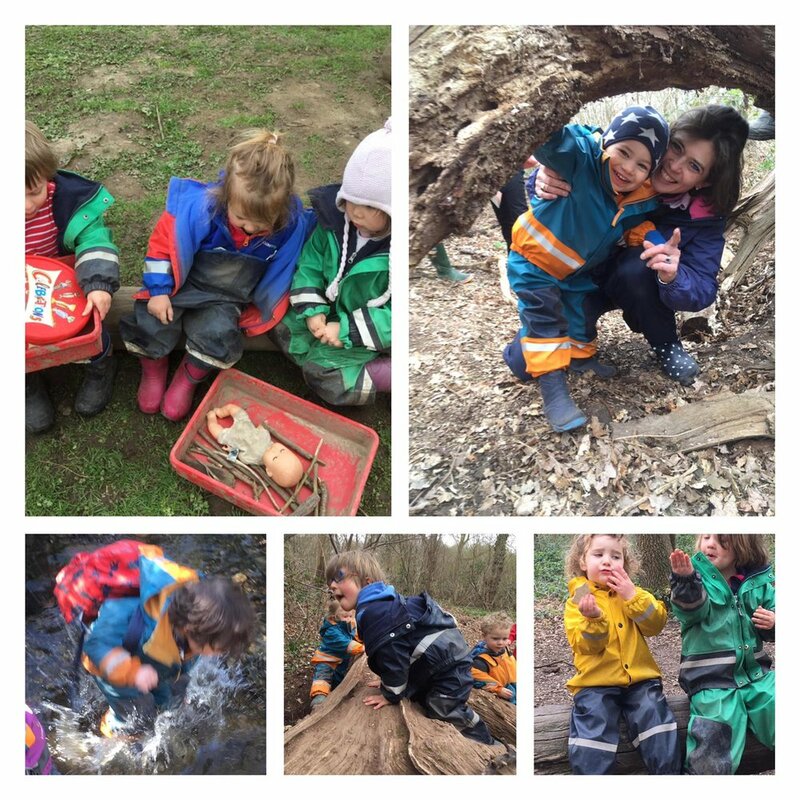 They have been keen to share the new areas they have found such as 'The Piggy Train', 'The Wooden House', 'The Holly Tunnel' and 'The Crocodile Swamp'. Parents have squeezed in line to sit on the Piggy Train and enjoyed snack before climbing into the Wooden house to help children make bowls of tomato pasta and share it with their friends that came to visit, while others supported their children climb, balance or weave in and out of 'The Big Fallen Tree'. One parent arrived with one of the Little Forest Folk-er's baby sister and the children crowded around to take a look. Some of our older children were really keen to share their knowledge about babies with the younger children "she has no teeth yet because she is teething.... then those teeth will fall out again and her big teeth will come!" and through a question and answer session with the parent they learnt new vocabulary and stages of childhood such as 'weaning'. Then it was back to putting on their backpacks and making sure they hadn't lost a parent - they tiptoed over the boardwalk that runs past the Crocodile Swamp and arrived safely on site. On site, some of our children have been busy making stop motion movies with Abbey who has supported the children to produce their own movies using a movie software app on the phones. The educators were treated to a premier about a robber who tries to steal the worms from the forest...don't worry, this newsletter doesn't contain plot spoilers! Other children have enjoyed using the video recorder to make short clips that feature stick characters that meet grisly ends...one little boy filmed his stick character saying 'Bonjour...Bonjour....Bonjour!" before he snapped in half! What was really heart-warming was the moment when they shared their video clip with friends who bent double laughing at the stick man comedy. This gave the educators a moment of reflection - like all the good things in life, the forest is made ten times better the moment you can share it with someone special. We hope you have a great weekend whatever you are doing, be it directing your own family movies in the great outdoors, visiting friends and family or taking your own adventure walks and building stories around interesting landmarks you discover!